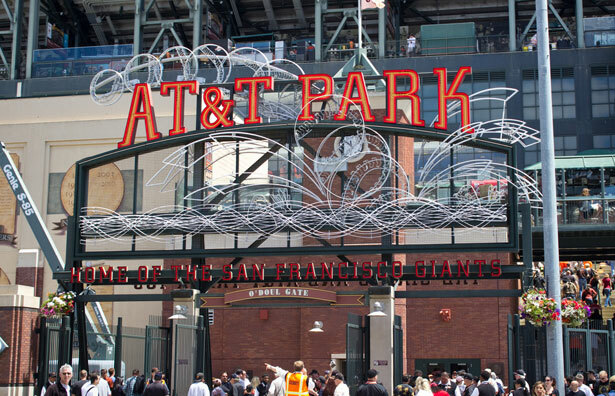 A strike vote of workers at AT&T Park has national ramifications. Picture AT&T Park, home of the World Series champion San Francisco Giants. Picture about as breathtaking a baseball stadium as exists in the United States with the San Francisco Bay, otherwise known as McCovey Cove, framing the outfield like a Norman Rockwell postcard as conceived by Leroy Neiman. Picture seats packed with people clad in their iconic orange and black reveling in the once hard-luck team that now defines the city and stands atop the game. What we don’t picture when we conjure images of this or any ballpark are the people actually doing the work to keep it all running. As idyllic as the aesthetics of the park remain, those prepping the food and cleaning the toilets make $11,000 a year in a city where, due to yet another round of tech-bubble gentrification, they cannot afford to live. Concession workers at the park earn their $11,000 in a city where a one bedroom apartment runs $3,000 a month and people are spending near that much to live in laundry rooms and unventilated basements. These same workers, who commute as much as two hours each way to get to the park, have now gone three years without a pay increase. This despite the fact that the value of the team, according to Forbes, has increased 40 percent, ticket prices have spiked and the cost of a cup of beer has climbed to $10.25. This also despite the fact that, as packed sellouts become the norm, the stress and toil of the job has never been greater. Now, the 800 concession workers, represented by UNITE HERE Local 2, have voted 97 percent to strike. The workers are ready. Feliciano said to me, “We come there rain or shine. Are we striking? Not yet. But these workers are ready to strike.” The community, the Major League Baseball Players Association and the players on the Giants, from Buster Posey to Tim Lincecum to Sergio Romo, should support them as well. As for the negotiations, they display all the arrogance of both Centerplate and Charles Johnson. During one session, while management scolded the union for thinking they were worth more than $11,000 a year, hedge fund honcho Mike Wilkins, a partner at $400 million Kingsford Capital Management, was on the field running the bases with 100 of his buddies, at a one-day rental cost of $500,000. This was described to the website Buzzfeed as an exercise in “grown up boys fantasy time.” Will San Francisco ever again be anything but a playground for the overgrown millionaire children of the tech sector? That’s the question. We’ll find out the answer in the weeks to come. Go to thegiantzero.org for updates on the struggle.